What a student can do on their own, working independently or without anyone’s help. What the student can do with the help of someone. What it is beyond the student’s reach even if helped by someone else. He called the second stage the Zone of Proximal Development (ZPD) which had, as said, two limits: the lower limit, which was set by the maximum level of independent performance, and the upper limit, the maximum level of additional responsibility the student can accept with the assistance of an able instructor. But Vygotsky believed that learning shouldn’t follow development, but rather should lead it. A student should constantly be reaching slightly beyond their capabilities rather than working within them (Jo Turner-Attwell, 2009). This reaching beyond one’s capabilities can be pictured as the student entering their Zone of Proximal Development. And this exploration beyond one’s capabilities is not to be made alone, but with an instructor to help in the way. Vygotsky called this instructor the More Knowledgeable Other (MKO), the role of which is to help the student throughout their ZPD by scaffolding the path they have to follow to learn how to solve new problems. The Personal Learning Environment could be understood both as the Zone of Proximal Development and the full set of More Knowledgeable Others, understanding by More Knowledgeable Others not only as people of flesh and blood, but any kind of knowledge construct that we can imagine: from the more typical teachers and open educational resources to all sorts of digital content including messages in fora, multimedia files and so on. As Graham Attwell (2010) puts it, the MKO can also be viewed as a learning object or social software which embodies and mediates learning at higher levels of knowledge about the topic being learned than the learner presently possesses . The role of a Personal Learning Environment may be not only that of a tool to provide access to ‘More Knowledgeable Others’ but as part of a system to allow learners to link learning to performance in practice, though work processes. And taking a wider view of artefacts as including information or knowledge accessed through a PLE, reflection on action or performance may in turn generate new artefacts for others to use within a ZPD (Graham Attwell, 2010). All these reflections stand for a static approach to the Zone of Proximal Development, that is, at a given time and at a given place. Indeed, in Vygotsky’s time, the boundaries of the ZPD were indeed very physical: the evolution of a wood carver’s craftsmanship was bound by the availability of master craftsmen and the possibility to be an apprentice in a nearby workshop. But Information and Communication Technologies have capsized the whole previous scenario and, thus, the relationship between Personal Learning Environments and the Zone of Proximal Development should be approached not only within the state-of-things prior to the Internet, but also in how this state-of-things is shifting forward. Thus, one way to look at the ZPD-PLE relationship is seeing the PLE as a way to build, fill in with or reach out for the tools and people that will help a learner through the ZPD. Another way to look at the ZPD-PLE relationship is how the PLE (re)defines the ZPD itself, continuously, dynamically. Unlike in a world without digital access to information and communications, in a digital world content and people are available all at once. Maximalistically speaking, a PLE can be conformed by virtually everything that exists out in the cyberspace. If virtually everything is at reach, virtually everything can be understood as the more knowledgeable other. With a full, total, comprehensive access to the more knowledgeable other there virtually is no upper limit of the Zone of Proximal Development, there virtually is no level of problem solving that is unreachable for the student. It helps in building the inner structure of the ZPD, its components. It helps in building the outer structure of the ZPD, its boundaries. There is a sort of corollary to the previous second statement. In Vygotsky’s time, learning — and hence the ZPD — was sort of linear: woodcarving apprentices would move “up” to a new master craftsman once they had mastered some skills themselves with the help of their previous/actual master. Progress would end when there were no more master craftsmen around whom to learn from. On the other hand, learning face to face with a human more knowledgeable other meant not only that one had to “use them up” but that one could not “consume” any other more knowledgeable others: learning was unidirectional, linear. When MKOs are conformed by all kind of tacit and explicit knowledge constructs in one’s PLE, there is no way of (a) “using them up” and (b) not being able to move in parallel with more than one more knowledgeable other. We can then think of the PLE both as the biggest ZPD possible, or as the overlapping of different snapshots of a PLE that evolves “fractalically”, multidirectionally, on time, on demand, until it (potentially) covers the whole cyberlandscape. One of the conclusions that one might infer from the previous statements that they are proof of the postulates from thinkers like Syemour Papert, Roger Schank or Nicholas Negroponte: in a digital world, all you have to do is build a PLE as big as the biggest imaginable ZPD. Imagine all you need to learn and it already is out there. I personally do not agree with that thesis. If PLEs can be understood from a dynamic point of view and work well for all your life-long learning and corresponding ZPDs, it is also true that, from a static point of view, they need to be built to scaffold your way through a specific ZPD. And it is in this scaffolding that help is required. In other words, and summing up, I believe that it is likely that we see a decreasing need of instructors as more knowledgeable others in order to learn something, but an increasing need of instructors as more knowledgeable others in order to learn how to learn something. With Personal Learning Environments to cover the ground of one’s Zone of Personal Development, learning how to learn, how to design one’s own learning process may be more relevant than ever and require more help from third parties. This is, I think, the most promising future of teaching today. Peña-López, I. (2013). Heavy switchers in translearning: From formal teaching to ubiquitous learning . In On the Horizon , 21 (2). Lincoln: NCB University Press. Peña-López, I. 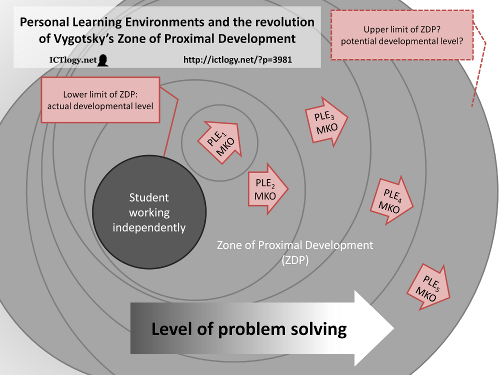 (2012) “Personal Learning Environments and the revolution of Vygotsky’s Zone of Proximal Development” In ICTlogy, #107, August 2012. Barcelona: ICTlogy. Peña-López- that is fantastic explanation of Vygotsky theory and tying with elearning makes it indeed a powerful theory.The implication of Vygotsky theory in instructional design is clear- most of the things up to the lower limit of Zone of proximal development can be delivered to the students. However, above upper limit of the ZPD more intractive content may assist the learner. On the third stage and line with the connectivism theory the MOOC would hand it. Thank you Isma for a powerful explanation of ways to improve learning, summed up by your expressing that there is “an increasing need of instructors as more knowledgeable others in order to learn how to learn something”. It reminded me of a TED talk by Dan Meyer indicating how we teach math today (inadequately) and how it ought to be taught to motivate real thinking, and yes, learning. Thanks for this excellent post. I will be sharing it with the preservice teachers I teach here in Australia :) There is a great need for resources like this, which connect new ideas about PLNs, PLEs and connectivity to existing psychological models. The three ideas presented above is an eye-opener. My job is not related to teaching but those words struck me. This post is a great resource for teachers, educators and mentors out there. academic advantage at its best, I would say. I am seeking permission to use a screenshot of Vygotsky’s ZDP found in your article, in my dissertation. I would greatly appreciate this. On the Horizon, 21 (2). Lincoln: NCB University Press. My name is Easton Phidd. I am pursuing graduate work at the Institute of Education (IOE) in London, England. Your peice on heavy switching and translearning has sparked some interest with me and my dissertation pursuits. In particular, I am interested in the multimodal dynamics in developing academic literacy in L2 users. The internationalization of HE institutions makes L1 + L2 access and usage of formal, open and informal learning resources quite a strategic bit of decision making for todays multilingual learners. Actually, I am attempting to reconcile Engeström’s “activity theory” and his later (2011) critique of Design Research theory in favour of Vygotsky’s “double stimulation” and his take on “formative interventions”; with your proposed model. a) If you had done (or know of) any empirical research of your substitution patterns between formal and informal resources and particular syllabus scenarios? b) How, in more precise terms, would you define what you mean by ” heavy switching” or “subsitution pattern”? c) I may be interested in attempting to survey some L2 learners/users in a graduate programme here on their strategic choices in their learning resource general approaches (learing styles) and behaviours (learning strategies). Might you have any views on how your model impacts L2 users? Sorry to burden you with so many questions; but I value your intriguing work and further insights. You work will definately be cited in my future pursuits. Dear Easton, thank you very much for your thorough comment… and questions. I posted a detailed answer at A comment on PLEs, ZDPs, heavy-switching and translearning . You will find there not only comments to your questions but a good bunch of papers and presentations for further reading. I’m amazing with your fractalically approach of the ZPD. It’s a really good way to explain Vygotsky’s ZPD recency. I AM A PhD STUDENT, I REQUEST FOR PERMISSION TO CITE YOUR MATERIAL. WITH REGARDS. Nice piece of work. The next step is to derive concrete guidelines for educational designers. Thank you very much for van Merriënboer & Kester’s reference. I neither knew the chapter nor the handbook. Part of it will come this Winter as a book chapter (in Spanish) but I will most likely work on the rest in English next year. I really like the reference to Vygotskys ZPD. It is so true that a PLE is an extensive recourse for leaners. As the world around us evolves, educators need to understand how their job will change. Teachers are no long the internet information dump but rather the guide to the tools available and the learning process.